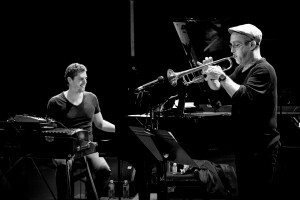 Dave Douglas, trumpeter and frequent guest of the Wexner Center, returns to Columbus next Tuesday at 8pm with his invigorating collaboration with Parisian pianist Frank Woeste, Dada People, as one of a handful of US dates co-sponsored by the French-American Jazz Exchange (tickets available here). I was lucky enough to speak to Douglas by phone. For more information on the band and project, videos and a Bandcamp link to the record, continue reading below the jump. Dada People is a continuously unfolding record, challenging and beguiling, drawing the listener in but not giving its secrets up too quickly. With the musicians at the Wexner Center, it promises to explode live.